Trail conditions are based on available regional weather data as a service to help riders decide whether to head for the trails. After periods of snow or heavy rain, local trail conditions may not match the most recent weather data. Please protect the trails by riding fire roads if single track trails are muddy. Mountain biking is an inherently hazardous activity and individual trails may include muddy or slippery sections or other difficult obstacles at any time. 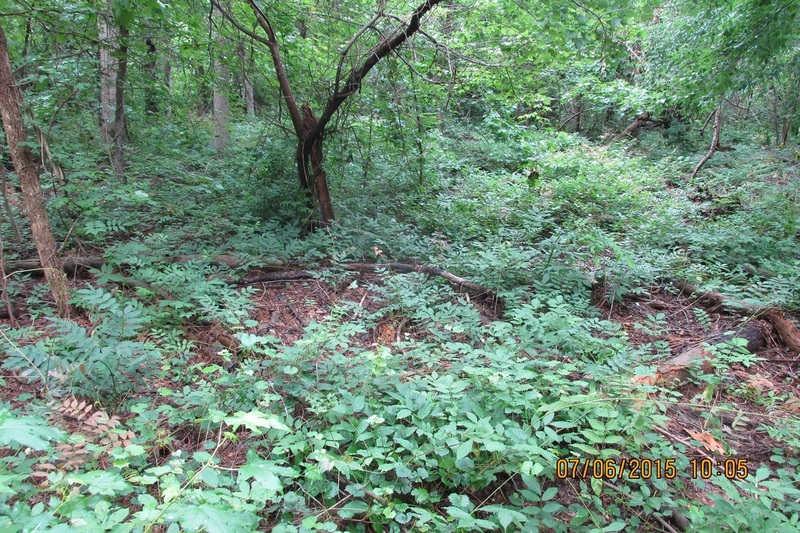 Invasive plants are a continuing problem for the park. With a tight budget, it's not possible for park staff to keep ahead of tree-of-heaven, stiltgrass, Chinese wisteria and all the other introduced plants that threaten to alter the ecology of the park. Ben Hedges leads a weekly work session to help control these unwanted species. Details are posted in the Invasive Plants Control event posting in our Meetup site. Other work sessions can be scheduled to meet the needs of volunteers seeking service hours. If you are interested in this service project or any others at the park, please contact us for more information. 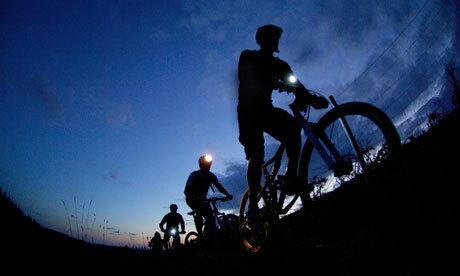 Night mountain biking returns to Pocahontas starting on October 5th. To ride, you'll need to display a signed permit for each rider (or risk a fine and ban which would be a shame). We suggest filling one out and putting it in your glovebox so you always have one with you (maybe bring along a couple of extras for buddies?). You'll also need to be finished no later than 9:00 pm. More Info. We had a great time on the trails last year with no injuries to speak of. Let's be conservative and safe out there folks! Leave Your Mark on the Park! Our dedicated volunteers have assisted in building and maintaining many miles of new mountain bike trail at Pocahontas State Park, including several trails purpose-built for use by handcyclists. You can leave your mark by volunteering your time, by organizing your company or service group to volunteer for a day, or by sponsoring trail construction by donating directly to the Richmond Regional Ride Center. To sign up and volunteer please visit our meetup site. Long time volunteer and Scouter Monty McNeill is taking Eagle Scout project opportunities to the next level by providing a single contact point for Park-related projects. Monty and his team have created a complete list of opportunities for Scouts to consider and the Friends of Pocahontas are backing him up with funds for materials and equipment to help Scouts be at their best. Already we've had Scouts work on trail features, build benches, add bike racks, design information kiosks and more! If you have an Eagle Scout who is interested in one or more of these projects, please contact us here. Design and build an event cart to be used by FOPSP to support group awareness, fund raising activities at concerts, athletic and other park events. Replace wooden trail features” on Morgan and Lake View Trails. Develop a map and list of the “Best of Pocahontas” to guide cyclists and hikers to scenic areas, cemeteries, rock outcroppings, unique natural features or fauna. Include emphasis on preserving these features along with education. Do interpretive work on the trails; add signs for plant species and locations for bird /animal watching with information kiosk on what to look for. Develop virtual geocache trail for identifying trees, plants and mineral out cropping’s on a trail system. Nature center and or Website based guide for geocache trail park user access. Species map for hikers and bikers to identify the park locations for best viewing each species. Nature center and or Website based guide for park user access. Species identification kiosks on Beaver lake trail at key lookout points. Create a fishing guide map to include information to increase success, how to target species, species in the lake and how to identify, tackle tips and lake map with topography to show water depth.. Nature center and or Website based guide for fishermen access. Alternative is a large kiosk at Swift Creek boat launch. Create map identifying recommended routes/loops for running distances of 5, 10, 15, 20 and 30K loops. Create special trail identification symbols on trail to keep runners on track. Include kiosk specifically for running and this information at primary trail head. Rainfall monitoring station with real time accurate rainfall data that sends data to FOPSP website for updating trail conditions. Conduct a park trail use study including the use of counters to establish use patterns and data for park staff to utilize for future. Rain fed horse trough system at suitable points on horse trails. Signage advising hikers and bikers of equestrian trail use how to respond to equestrians. Keep all trail users safe during encounter between equestrian, hiker and biker. Rock armoring/hardening of a specific trail loop. LV1, LV2, LV3 Green, Blue, Red and Double Red. Possibly 7 projects. Develop and build enhanced trail features with sustainable features on specific trail loop. LV1, LV2, LV3 Green, Blue, Red and Double Red. Include signage to help riders accomplish the feature successfully. For the Green and LV1 trail focus on beginner friendly trail features, wide/low teeter totter for example. Possibly 7 projects. Develop the garbage dump trail, clean it up. Develop a trail extension that enhances user experience, safety and sustainable. - In progress.